← @AnayaLeather has her beautiful hand-crafted leather purses and jackets at @local-E BAZAAR! Herro Hachi makes t-shirts that laugh with you, not at you. We believe that you can make someone laugh without sacrificing style and dignity (okay, maybe a little dignity), which is why our philosophy is to make funny fashionable for everyone. It all started with an idea to be funny on a t-shirt without being boring. Throw in an obsession with travelling and a fascination with the quirkiness found in every culture, and a cool t-shirt company was born. We’re fun, funny and our t-shirt designs aren’t too shabby either. Whether you’re a gamer, a foodie, a photographer or just a jolly person who loves giant bowls of noodles, we have something for everyone. We aim to make you smile, laugh and look good whenever you wear one of our designs. It’s just how we do. This entry was posted in Uncategorized and tagged #shoplocal, BAZAAR, Biltmore Cabaret, Herro Hachi, local-E, t-shirt, vancouver. Bookmark the permalink. 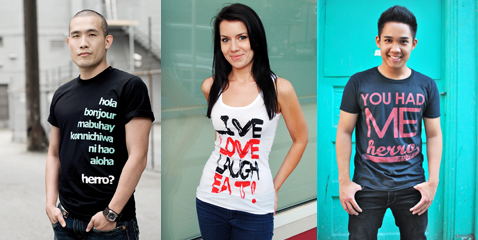 1 Response to Funny and Fashionable Men’s & Women’s t-shirts from @HerroHachi at local-E BAZAAR! It’s nice to know that there are many types of shirts available in the market that can be purchased if you want to appear more fashionable. Even men can benefit from these shirts as long as it fits their style and body frame as well.